The Lebanese Sunni politician and his family have long been inextricably tied to Saudi Arabia and its royal house, as well as professing a pro-West orientation. However, it was suddenly noticed in Riyadh, as well as Jerusalem, that the most devoted Saudi loyalist in Beirut had quietly crossed the lines. Hariri had quietly decided to follow the Iranian star and throw in his political lot with his old enemy, the Shiite Hizballah. And they had promised he would retain the premiership after Lebanon’s May 8 general election, in which their Shiite March 8 Alliance was sure to win a majority in parliament. 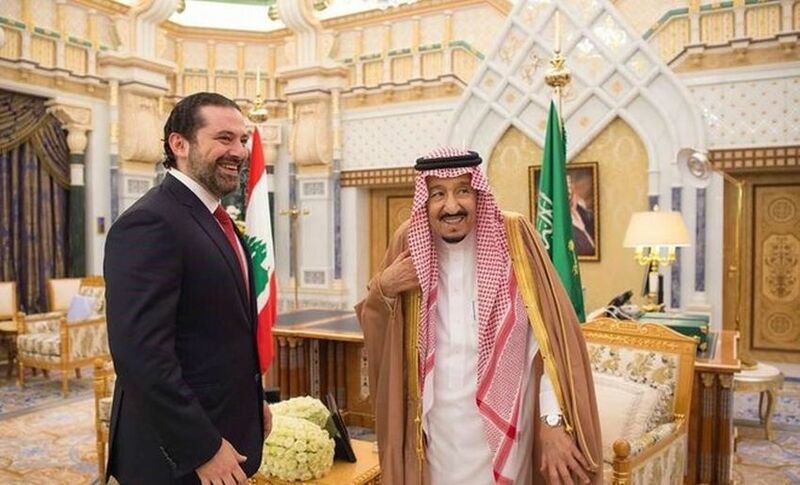 Caught unawares by Lebanon’s imminent slide into the Iranian orbit, Saudi rulers hurriedly summoned Hariri to Riyadh. He arrived Wednesday Feb. 28. But it was too late to change him back. The prospect of an Iranian puppet government in Beirut is stunning news for Riyadh, which has traditionally regarded Beirut with its banks and varied luxuries as their back yard. But for Israel, it spells disaster. It means that Iran has succeeded in expanding its ominous, belligerent presence into both of Israel’s northern neighbors, Lebanon as well as Syria. That the Saudis were caught napping showed in the interview the Washington Post ran Wednesday with Crown Prince Muhamed bin Salman. Referring to Saad Hariri, the prince commented: “Now he is in a better position in Lebanon” – clearly unaware of the shock ahead. When the Lebanese politician was last summoned to Riyadh five months ago, he landed amid a domestic upheaval – as a result of which he, along with hundreds of Saudi notables, was stripped of his fortune before being allowed to leave. This visit, which Hariri would have preferred to avoid, coincided with another Saudi upheaval, the shakeup of its entire military and defense leadership. Both these earthshaking Middle East events are examined in detail and analyzed in the coming issue of DEBKA Weekly out on Friday, March 2. If you are not already a subscriber, you can still catch this issue by clicking here. He and his country are the loser not Israel or Saudi Arabia. Let Iran pay the bill for him and his military which eventually will be destroyed. Israel should not complain as for years have infringed Lebanese territory and attacks Lebanese , try to take their oil and gas and expect for a Lebanese to support Israel? Lebanese cannot even have a decent defence system under Western system. Odd isn’t it? Why they owe you guys a living? To Peter, Idiot you are, speak you must learn…. This is a very hyperbolic “report” from Debka. He has not “flipped”, as he was never an actual friend of Saudi Arabia to begin with. However, this is balanced by the fact that he is not a friend of Iran or Hezbollah either, and he only struck a pragmatic power politics based bargain with them for the premiership… which is similar as to what he has done many times over already in Lebanon over the years. He’s a typical self-interested politician that you can find all over. Hmmm. I’m not so sure. There seems to be a lot of events occuring below the surface and out of sight. What we do manage to see is often confusing and at odds with our common perceptions. I believe something on a larger scale is afoot. Iranian belligerence will usher in the Jewish-Arab alliance. Between the Nile & Euphrates, there will be a new political reality, devoid of all foreign influence, especially Iranian. Arabs hate Shiite Persian imperialists far more than they hate isolationist Israel. This is the most delusional thing I have read in weeks. Lets not slip into ‘When Prophecy Fails’ territory. If you think Sunni and Shite get along, then you are obviously ignorant of 1,400 years of history. Well I spent 6 weeks in Syria before the Arab spring, and the Sunnis I made friends with never had a bad word to say about Shiites. Which Arab countries have you visited? I thought it went without saying, but perhaps not with some people … those Sunnis I befriended in Syria definitely had bad things to say about Israel. This talk of an Arab-Israeli partnership is nonsense, and as recently as 1989 Israel and Iran were allies. Israel needs more mature leadership to make more intelligent decisions about who to ally with. Jim, So your 6 weeks disproves 1,400 years of ???? BTW, I’ve been in Giza and in the great pyramid. You are the delusional one. Arab countries are allying with Israel right now, to stop Iran. This is not conjecture. Arab dictators are allying with Israel right now, to stop Iran. Whether their people are with them … I am skeptical. Nassrallah spends a lot less money on whores and palaces than MBS does. This reminds me of “the Shah will never fall” talk. Arab dictators? They’re all dictators. This is an Intra-Muslim battle over control of Mecca. Saudis have it. Shite Ayatollahs want it – and they are willing to start a World War to steal it. I’m not expert, but presumably the Iranians won, and the Saudis lost, in Syria, and the same dynamic is being repeated in Yemen. So, The Lebanese are shifting with the wind, as small, vulnerable nations must. The Iranians dream of a new Persian empire – including Mecca and Jerusalem – perhaps with the Chinese model: High-tech economy with political repression at home. They did well in Syria vs. the bumbling Saudis and feckless Americans; but beyond that, they will probably be stretched too thin. The Syrian war is far from over. When it is finally over, there will be no country called Syria. We are no longer just looking at the strength of Iran’s regular armed forces or the multiple other armed groups such as the Revolutionary Guards, basiji, police, border guards etc.. We have been witnessing the forming of Shi’a militias in Iraq, Iran, Syria, Lebanon etc. who are getting ever better weapons and training from Iranians, making them a formidable force when put together. Those guys are tough, battle-hardened soldiers. Many hundreds of thousands of them just from those four countries, but also coming from Yemen, Afghanistan, Pakistan, southern Russia, Bosnia, Albania etc..
Treif, Fascist Iran couldn’t even defeat Sadaams Iraq, they fought for 8 years, 1M died. Israelis are motivated to survive, your friends are motivated to kill and die for “allah”. I find these kind of “win/loss” analyses to be fairly amusing. Saudi Arabia never had control of Syria in the first place, it’s been a close Iranian ally for decades. All that’s changed on the ground is that Assad has had to sell his country off to his Russian and Iranian allies and pass most of the remainder off to local warlords, while the conventional Syrian army has been ground to dust and replaced with poorly armed and trained paramilitaries backed by the Russian air force. The fighting against ragtag militias and starving civilians-turned rebels, in which Iran and its allies also enjoy complete air supremacy, will be very different than what they encounter if they go up against a real army which perceives real threats to its home population. First time commenter. I think if Israel were to not view/portray Hezbollah as a terrorist organization and plan and aim for it’s total destruction, it can achieve the aim of disarmament and peace on the Northern front, including the Golan frontier, much easier and faster. Iran’s strategy is not the destruction of Israel but defense against attacks by it and KSA, including manipulating the USA into war against it. They feel under siege after decades of war and sanctions imposed on them and feel justified in their defensive postures including coming to Hezbollah and Assad’s aid (Houthis too). The current scourge in the world is Sunni Islamic extremism and the head of the snake lies in Riyadh! The scourge of the world is islam. .more dangerous the nazi Germany. Iran continually talks about the total destruction of Israel. Hezbollah and Hamas wants to go to war and defeat the Israeli’s. What a load of trash. Go hang yourself from a crane with a hijab, you lying twit. Fascist Iran is trying to export khomeni the dog “islamic revolution”. Fascist Iran’s constant calls for the eradication of Israel are fueling Fascists Irans own destruction. Israel is well equipped to destroy Tehran, Qom and other hell holes of shia depravity. Fascist Iran is BEGGING for its own annihilation to trick their “madhi” into popping up. So there will be no “mahdi” and NO IRAN ever again. The best thing is to have Persians rise up and overthrow Satans Ayatollahs who are driving WW3 which will spell the End of Islam for all time. The important thing to note is that Lebanon is a puppet of whomever gives its “leaders” the best bribes and wasta. In every practical sense, Lebanon is an Iranian satellite controlled by Hezbollah. Lebanon will not decide when the missiles are activated, that decision will be made by Iran-Hezbollah. The Lebanese people are hostages of their own little dictator leaders who are in cahoots with whatever islamist group pays them the most to be their dhimmis and traitors to the Lebanese people – the Christians of Lebanon are finished unless some miracle occurs. For Israel it makes little difference if it is Hezbollah or Saudi are in control over the government because facts on the ground point to Hezbollah as having the control along with their Russian and Iranian protectors. One day the Russians and the Iranians will be fighting for hegemony over Syria-Lebanon, mark my words. The only true Islamic force in the ME is Iranian military and political might. All else are pretenders to the role of guardian of the prophets. Sunni leadership is a facade of Anglo Shoeish deception to destroy the Muslim religion and people. In fact Sunnis are now turning against their false masters in Riyadh and Tel Aviv. All the yankee petroleum dollars cannot buy the truth from the hearts of the believers. Do you jerk-offs ever get tired of beheading and destroying your own people and following the sick words of a belief system that is filled with anger, death and destruction and really nothing good at all? Iran is far too powerful, even America soils herself before the Persians. Israel is doomed. …Iran is only ‘powerful’ until it actually has to confront a real military. The facts are that the IRG has performed very badly in past engagements, even with russian support. The IRG was in command of the ill-fated exercise that resulted in a total wipe out while trying to cross the Euphrates. Nobody is going to enjoy the next war. But it is safe to assume that a panicked Israel will ensure ALL of its enemies are dealt with prophetically. Fascist Iran couldn’t even defeat Sadaams Iraq. They had an 8 year war, 1980-1988, 1 million people died. Plus India almost had a nuclear war with Pakistan, another land ownership dispute. And Islam’s most sensitive pressure point is…. Mecca. Fascist Irans military goosesteps like their brother Aryans – and everyone knows what happened to Aryan Germany. DomiDICK, You forget one little thing. US President Donald J. Trump who has taken the gloves off the US military. Jesus will destroy the Persians and ROSH and anyone else who attacks Israel at Armageddon. Israel will then inhabit the land from the River of Egypt to the Euphrates as promised to Abraham and his descendents. It’s time for most bloggers here to read the Jewish prophets of 2300 years ago, Ezekiel and others. Also Jesus in Revelation. Under Obama, yes; but not under Trump. Israel is a defeated thieving nation supported by money that was stolen from US citizens pockets without consent. The shoes lost more than any nation in history and are now only the cowardly forward base of Anglo petrol operations. For liars and cheats who support the coward shoes with yankee bucks you cannot cheat the history books only your illiterate self deluded minds. 1 Jewish majority country can NOT be defeated by 57 Moose-Limb majority SH*THOLES. Speaking of Iran’s military power, does anybody know when Iran won a war last time. I think it happened more then 900 years ago. The truth is… Biblically & realistically. Israel is well and truly doomed to complete and utter devastation… Why do I say this? The answer lies with the formation, poise and alignment both today. And within ancient scriptures. Israel will and it’s land will unfortunately become inhabited and the land stripped bare. Only 10% within this land, will survive the unprecedented next war. Biblically Israel utterly and completely loses the next war. And seems as though… Messiah Himself is deliberately allowing Israels mass population to greatly diminish before the Lord rises up for Israel… (What is left of it). Yeshua Ha Mashiach Ha’Adon!! Every Knee shall bend and every head shall bow!! Yeshua will have the last word on Israel, Jerusalem, all of the middle east, all of the world, and everyone’s eternity!!! Know this!!! I sympathize with the plight of the Christians of Lebanon, but this does end the charade that The Lebanese military can be given arms. All of Lebanon is game in the next war. Hizbullah should be very careful. This changes everything.